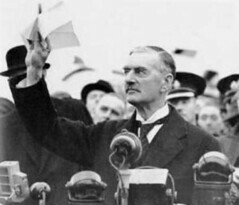 If I mention the name Neville Chamberlain, chances are you will immediately form an image of a man holding aloft a piece of paper and proclaiming, “peace in our time” while Hitler was preparing for war. Chamberlain is generally regarded today as a dupe who foolishly believed that Hitler would keep his word and as a man who advocated appeasing an aggressor in order to keep the peace. I think this impression is just a little unfair. It is easy for us to condemn his actions. We know what happened next. Chamberlain did not have the advantage of our hindsight. 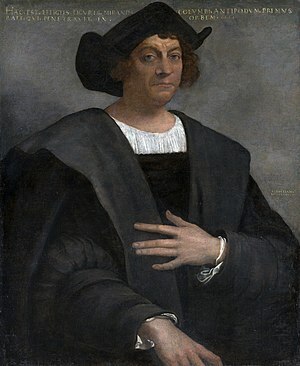 A review of his career shows Chamberlain to be a capable politician and leader. He was not brilliant in the way his contemporary Churchill was, but he rose steadily and swiftly to Prime Minister. Neville Chamberlain was born on March 18, 1869 in Birmingham. His father, Joseph Chamberlain, was a successful businessman and politician. Neville followed his father’s footsteps enter the worlds of business and politics. His party was the Liberal Unionist Party and then a Conservative when the parties merged. He was elected to the Birmingham city council in 1911 and became Lord Mayor in 1915. World War I had broken out and in 1916, Chamberlain was made the Director of National Service, which, among other duties, placed him in charge of conscription. Neville Chamberlain then ran for Parliament and easily won election. He was a dutiful Member of Parliament, rarely missing debates or votes. He served terms as Minister of Health and Chancellor of the Exchequer when the Conservatives held a majority. In general, he was competent and was able to advance bills to reform the relief of the poor and help Britain pay off its war debts from World War I. As Exchequer, he cut the budget ruthlessly and by 1934 Britain had a surplus. His cuts included cuts in Britain’s defense, but Chamberlain was not clueless about the threat from Nazi Germany, and as Hitler began to rearm, Chamberlain increased defense spending again. On May 28, 1937, Neville Chamberlain was named Prime Minister after the resignation of his predecessor. He became Prime Minister largely because he was next in line and it was his turn. He was not a very popular or inspiring figure in the Conservative Party and no one expected him to be anything but caretaker who hold the job until the next election. He was competent and might have been remembered as a good Prime Minister in more peaceful times. These were not peaceful times and Chamberlain was somehow not quite up to the task of managing the crises caused by Hitler’s increasing belligerence. In March 1938, Hitler invaded and annexed Austria. Chamberlain denounced this violation of the Treaty of Versailles in Parliament, but there was nothing he could do about it. Judging from the cheering crowds that met the Wehrmacht as it marched into Vienna and from the results of the subsequent referendum, this seemed to be what most Austrians wanted. One could argue that since the Germans and Austrians were basically the same nationality, this union or Anschluss was simply an expression of Hitler’s nationalism. It didn’t mean, necessarily, that he wanted to conquer other nationalities. Next, Hitler demanded the sections of Czechoslovakia known as the Sudetenland on the grounds that the German minorities in those regions were being persecuted. The fact that the Sudetenland happened to be a center of Czechoslovakian industry and an easily defensible border might have had something to do with Hitler’s demands. The Czechoslovakian government, knowing that without the Sudetenland their country would have little defense against Germany, resisted Hitler’s demands. Hitler threatened war. So it was that in September, Chamberlain flew to Germany for a series of meetings with Hitler in order to resolve the crisis. Chamberlain may not have been as naive in these meetings as is generally supposed. He was not really impressed by his meetings with Hitler and was shocked by Hitler’s displays of temper. Still, Chamberlain was determined to keep the peace and at the last of these meetings, in Munich, he came to an agreement with Hitler to sacrifice the Sudetenland. The Czechoslovakian government was not consulted. Chamberlain flew back to London with that famous piece of paper. Hitler invaded the remainder of Czechoslovakia the following March. It is easy to condemn Neville Chamberlain, in hindsight, but again, he could not know what the future held. He knew that Britain was not ready for war and he did not know that Germany wasn’t really prepared either, despite what Nazi propaganda asserted. One could even argue that Chamberlain’s actions bought valuable time for the allies. If so, Germany made better use of the time. Hitler made a formal alliance with Italy in May 1939, and negotiated a non-aggression pact with the Soviet Union in August. The agreement took the rest of the world by surprise since Nazi Germany and the Soviet Union had been implacably hostile to one another. Stalin, however, had seen that the British and the French were interested only in appeasing Hitler, perhaps with the hope that Hitler’s attentions would be directed eastward against him. Stalin, therefore, was very receptive to the overtures made by Hitler. For his part, Hitler believed that by coming to such an agreement with Stalin, he would be able to avoid a two front war and would have a free hand against the west. The non-aggression pact also made it impossible for Britain and France to live up to their guarantees to protect the Poles from invasion. So, when the war came, Hitler was in a better position than he had been the year before. I think that Chamberlain’s mistake was not that he was gullible or a fool. He knew Hitler was not very trustworthy. I think that Chamberlain’s mistake was in not realizing that Hitler was not playing by the same rules. He must have thought Hitler a German nationalist who wanted to expand Germany’s power, if it could be done without war. In other words, Hitler could be reasoned with. The idea that Hitler actually wanted war, that he glorified the struggle, may not have occurred to Chamberlain. He knew the contents of Hitler’s speeches, but perhaps he thought Hitler was only rallying his supporters.He didn’t really mean it, did he? He might have believed that Hitler might try to get around any treaty he signed, but surely he wouldn’t just openly violate an agreement he signed in less than a year, would he? Chamberlain was not the only one who underestimated Hitler. There were a good many German politicians who thought that once Hitler was brought into the government, he could be tamed. They couldn’t quite believe that he would overthrow the Weimar Republic as soon as he was made Chancellor and actually kill his opponents. Perhaps the lesson of Munich is not that appeasement never works but that you should not take it for granted that your opponent is playing by the same rules or wants the same thing that you do. When dealing with countries like Iran or North Korea, it might be dangerous to assume that they are either crazy or rational in the same way we are. The leader of countries like these are not crazy and their behavior might be entirely rational, from their point of view. In any case, maybe it’s time to give Neville Chamberlain a break.